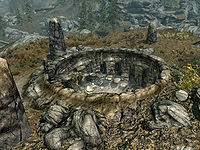 Dustman's Cairn is an ancient Nordic barrow northwest of Whiterun. It is located in the central tundra of Whiterun Hold. It contains two zones: Dustman's Cairn and Dustman's Crypt. There is a word wall inside for the Fire Breath shout. The interior is quest-locked, and there is little of value outside the cairn. There are a multitude of flowers including lavender, tundra cotton and mountain flowers around the outside of the entrance, and eleven hanging moss and an iron shield around the inside of the entrance. There is a well-maintained road between Hamvir's Rest and Fort Greymoor, and the path up to Dustman's Cairn comes a short distance before it ends at Hamvir's Rest. There happens to be an upturned cart, with its load of cabbages spilt, near to where the dirt path starts. You enter at the top of a short set of stairs. When you descend the steps, if you are not on the related quest Proving Honor, three draugr emerge from upright sarcophagi on either side of the room and attack. If you are there as part of the quest, Farkas will be accompanying you. The three draugr will be lying dead near the three sarcophagi. Regardless, check the table in the middle of the room for a copy of the Two-handed skill book Battle of Sancre Tor. Beside the book is a pickaxe and a lockpick. There is also a novice-locked chest beside the table. Two sideboards flank the stairs leading down from the entrance, one with some clutter, the other with a pickaxe and a bowl of bone meal on top. Around the room are two bleeding crown fungus, and two hanging moss. The path forward is opposite the entrance, it will be blocked by fallen rocks before the related quest is started. Among the rubble to the right of the passage is another pickaxe, and as you continue there are numerous hanging moss and various fungi throughout the ruins, some of the moss is unreachable. The next area contains four draugr, all of whom are standing in alcoves, in wait for unwary explorers. The first room to the right contains one of these draugr and a bleeding crown fungus. The room with the lantern contains another draugr. The third draugr is in the room opposite, in an alcove on the front left-hand side. The final draugr is wandering to the left as you follow the path northward to the next section of the dungeon. Through the door is a tunnel is covered with a thin cobweb you can walk through; on the floor, to the right is an orange dartwing. At the other end of the tunnel is a broken table and two dead draugr on the floor, beside one of these is an ancient Nord war axe. There are two iron ingots on shelves to the left of the table. The next room is safe to enter. To the left, down the stairs, are two thrones and an arcane enchanter. Across the room, on a set of shelves, is a random potion of the berserker and a leather strip. There is another set of shelves on the other side of the room holding a random potion of the defender and a goat hide. Against the south wall is a stone table with a dead draugr on top. The path forward, to the southeast, is blocked; you will need to activate a lever in the room to the northeast. The room with the lever also contains a bowl of bone meal, a potion of minor stamina, a potion of minor healing, a leather strip and a leveled healing potion. Follow the twisting path until you turn east. You will then see two members of the Silver Hand conversing on the other side of a raised section of the tunnel. When they are dead, check the first alcove on the right for a random helmet on a plinth that is trapped and triggers a poison dart trap from the north. There is a second orange dartwing on the ground. On the pedestal in the second alcove is a flawless amethyst and some loose septims. There is an imp stool fungus beside the pedestal, and a bowl of bone meal on some shelves beside where the Silver Hand members stood. The only items of interest in the next room are a pickaxe near a gap through which you can see further into the ruins and a luna moth wing on the left by some cobwebs (as well as a blue dartwing hidden behind the basket). Through the next door, are more catacombs with a draugr lying in wait; it is in an alcove opposite the door and slightly to the right. There is also an urn and two dead draugr that can be looted. The next room is to the east and contains a member of the Silver Hand standing over a bloodstained draugr and another member patrolling the walkways above the far side of the room. There is a novice-locked chest under the stairs and a small coin purse on the ground in the eastern corner. Ascend the stairs and turn around to the left. Search for a chain hanging from the wall beyond the rubble. This lowers a secret area to the left of the stairs that contains a high-leveled chest. There is a dead Silver Hand warrior lying on one of the sarcophagi and a level draugr to deal with. There are several urns and burial urns in this area and through the door to the east, a master-locked chest and behind the left-hand door, a large coin purse. Before descending the stairs to the south, grab the pine thrush egg, silver amethyst ring and hanging moss near the brazier to the left. On a table to the right of the stairs is a random sword, eleven loose septims, two potions of minor magicka, and two potions of minor healing. Beside the table is a burial urn, with another two on ledges above; one of these you will have to jump to reach as it is to the south, on top of the wall separating this area with the previous area where the pickaxe and luna moth wing were found. There are more draugr in the next section. The first is again lying in wait in front and slightly to the right of the door. There is one around the corner to the right by a large urn, and another to the left of some rubble further along the path. 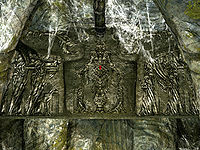 There is another draugr in an alcove to the left, another on the left by the rubble with two large urns among it, and one more straight ahead. There is a Silver Hand patrolling around here too. Past the Silver Hand member and a broken urn is the final living draugr. 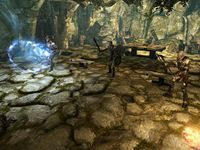 Near the top of a slope there is an ancient Nord battle axe lying on the ground, with a second one among the rubble on the right. Down the slope is a dead draugr by an adept-locked chest, with two burial urns to the left in an upper alcove. To the south is a flight of stair with a wooden door at the bottom. On the right is an urn and burial urn. The next room is populated by more Silver Hands. The first stands lookout on the platform straight ahead on the far side of the room, and to the upper right. There are white cap fungi in the northeast and southwest corners of the first area. There are two Silver Hand members standing by the fire in the middle of the second part of the room. The ramp to the first member is here, going back past you. Through the next door, behind the door to the left is a medium coin purse along with two rings and partway down in the middle of the stairs, is a pressure plate that triggers a poison dart trap from the right-hand wall. Two Silver Hands are at the bottom, hiding behind the pillars one on either side. There is an unlocked chest to the far left of corner before the final door. There is a Silver Hand leaning on a sarcophagus around a corner when you enter the crypt. 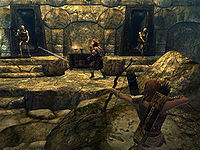 Through the door is an enclosed walkway above a large room: there are two Silver Hands below, who may provoke some of the draugr in the room. It is also possible to snipe the combatants with ranged attacks. More draugr lie in wait along the next corridor. The first is around the corner in the first alcove, the following two are on the outside of the corner (there is also a white cap fungus here). Down the slope is another white cap fungus, with a draugr on either side of the tunnel. 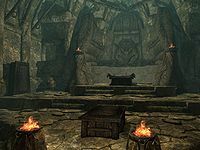 Around the corner from here is a Silver Hand, and two draugr lying in alcoves on the left-hand wall: these two will usually have been awakened by the presence of the Silver Hand. There is a final draugr in an alcove opposite the rubble up ahead. There is a white cap fungus lying loose at the corner and another two more loose fungi in the rubble further along and also one growing and an urn with some loot right at the top of the rubble. There is a chest in an alcove to the right. The corridor eventually ends above a room with a Silver Hand; once dealt with, loot the apothecary's satchel found on the sideboard to the right of the entrance. Underneath the stairs is an adept-locked chest. There are five burial urns spread around the preparation table opposite the chest. Opening the adept-locked door to the south reveals a selection of rare ingredients: there is a bowl of vampire dust, frost salts, two bowls of bone meal, a sample of ice wraith teeth and a potion of cure disease. The next room is the one seen from the previous walkway. There is a chest to the left that contains the Dustman's Cairn key among its loot. The key is needed for the far door, which is key-locked. There are two burial urns on the left and on a sideboard by a stone pillar near the middle of the room is a steel ingot and a stone bowl containing a leather strip. There is nothing else of interest except for any remaining enemies that you will have taken care of at this point. Beyond the locked door is a wide passage guarded by several skeevers. It ends with a door leading to a room that contains an alchemy lab and a table with three dead draugr lying on top. There is a novice-locked door to the southwest, behind which is an urn and a potion of minor healing. To the west is a cave-in with another burial urn among the rubble and a door opposite to the east. Through the door to the east is the tunnel that allows you to continue; there is also another skeever there. There is another skeever in the tunnel, and two frostbite spiders when the tunnel opens out, as well as an egg sac to the right and a couple of desiccated corpses that can be looted. You will need to take the higher path around the sides of the cave to progress, as the lower path is a dead end, and too high to jump up. There are two leveled draugr, one of which is a magic-user between the second bridge and the exit to the cave. In the corridor after this, there is a carving on the wall to the right, with a bright ruby lodged in the middle carving. The corridor after this contains only a white cap fungus, a hanging moss (both mid-way through the corridor), and some dead draugr. Through the iron door is the final room of the dungeon. There is a word wall for the dragon shout Fire Breath, a fragment of Wuuthrad, and a good many draugr. The draugr will only be activated once the fragment is taken. This also means that the shortcut back to the entrance of the cairn is inaccessible, as it is through a sarcophagus atop the stairs. There are a total of seventeen draugr that come alive, including a boss-leveled one. Additionally, the iron door magically locks with an apprentice lock. This door doesn't unlock after the battle. Beside the fragment are two random healing potions and three random soul gems (all the way up to black). There is a boss chest to the right of the word wall, and a few urns by the stairs to the right. The exit tunnel leads to the northwesterly sarcophagi in the very first room. Don't forget to pull the lever to lower the hidden wall. Unless you are on the related quest, you will only have access to the first room, which contains three leveled draugr to guard the loot. It is possible to use a rune spell to activate the draugr in the final room in smaller numbers prior to taking the fragment. This makes the final battle easier. If you have been sent here by a radiant quest after you have completed Proving Honor, you will need to reload your game and ask the giver for another quest. This is because this location does not respawn, and you will be unable to complete the quest. If you have received the quest before the Proving Honor quest, you should still be able to complete it while concurrently completing Proving Honor. Dustman's Cairn is erroneously marked as being in The Reach, which means quests sending you to Reach locations may send you here. 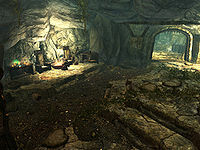 This issue has been addressed by version 2.1.1 of the Unofficial Skyrim Patch; it has been set to be part of Whiterun Hold instead. This page was last modified on 7 January 2019, at 05:07.